1848: he started his career as a disciple of the onnagata Fujioka Sengiku and received the name of Fujioka Kikutarô. 1850: he became disciple of the actor Nakamura Tamashichi I, who gave him the names of Nakamura Kikutarô, then later Nakamura Tamazô. 1865: Mimasu Daigorô V, who has lost his only son, adopted Tamazô and gave him the name of Mimasu Tanin VII. 3rd lunar month of 1868: Mimasu Tanin VII took the name of Nakamura Fukusuke III (Takasagoya guild). An adopted son of Nakamura Shikan IV, belonging to the Narikomaya guild, took the same name and the same line number in Edo at the same time. This unusual situation was validated by the Kabuki world and the two Fukusuke lines coexisted from the third to the fifth generations. October 1873: premiere at the Chikugo no Shibai of Katsu Genzô II's drama "Kimi-wa-Fune Nami no Uwajima"; Fukusuke played the roles of Yanbe Seibê and the yakko Dôsuke [casting]. October 1881: premiere at the Ebisuza of Katsu Genzô III's drama "Ogasawara Shorei no Oku no Te"; Fukusuke played the roles of Ogasawara Haito, the yakko Kikuhei (in reality the fox of Mt. Myôjin) and Ohaya [casting]. 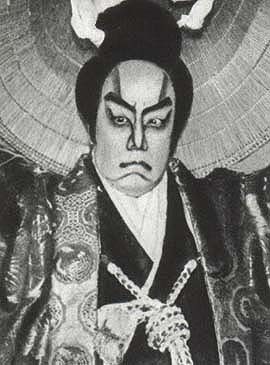 June 1898: the play "Rôben Sugi no Yurai", which was originally written for the puppet theater and staged for the first time in February 1887 in Ôsaka, was adapted for Kabuki for the first time and staged at the Minamiza; Fukusuke played the role of Rôben's mother Nagisa-no-Kata [more details]. October 1907: Nakamura Fukusuke III and his adopted son Nakamura Masajirô II took the respective names of Nakamura Baigyoku II and Nakamura Fukusuke IV in Ôsaka at the Kadoza; the new Baigyoku played the roles of Sakuramaru and Chiyo in the classic "Sugawara Denju Tenarai Kagami". Baigyoku was a haimyô used by the great star Nakamura Utaemon III. Premiere at the Kadoza of Watanabe Katei's chûshinguramono "Tsuchiya Chikara"; Baigyoku played the role of Takarai Kikaku [more details]. June 1921: Baigyoku appeared on stage for the last time, in Kôbe at the Chûô Gekijô. 8 June 1921: Baigyoku died. Nakamura Baigyoku II was a kaneru yakusha, excelling in both jidaimono and sewamono. He played a lot with the Kamigata stars Jitsukawa Enjaku I and Nakamura Ganjirô I.